You are currently browsing the category archive for the ‘Cycling’ category. I’ve decided that the trouble with Germany is that Germans think like me. 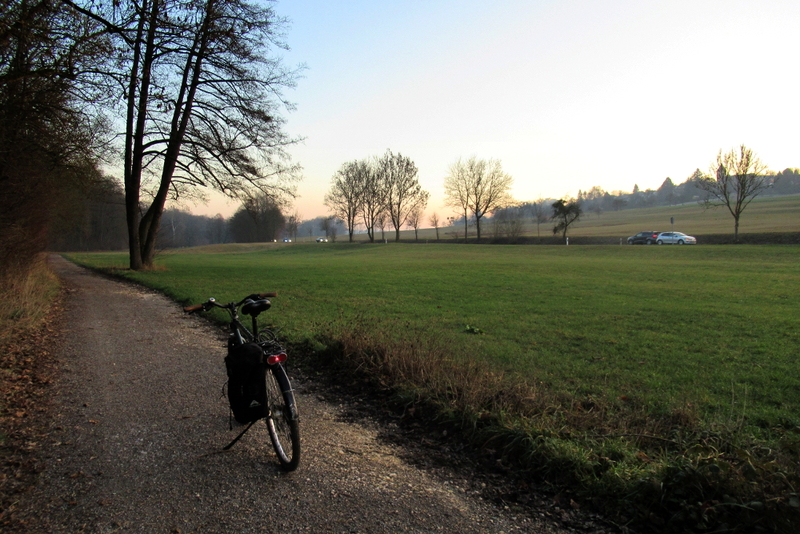 With the weather improving, the cycleways are increasingly busy, and to avoid getting tangled up in the melee I need to leave early as trails within a few kilometres of the city fill up fast, especially if they have a Biergarten at the far end. After a slightly tedious ride past the airport, again, and through another town, I ended up on a very pleasant, paved and traffic free route which, being on a slight ridge gave an excellent view all around. One of the things I could see was the cycleway I was supposed to be on. I probably should have looked at the map first. 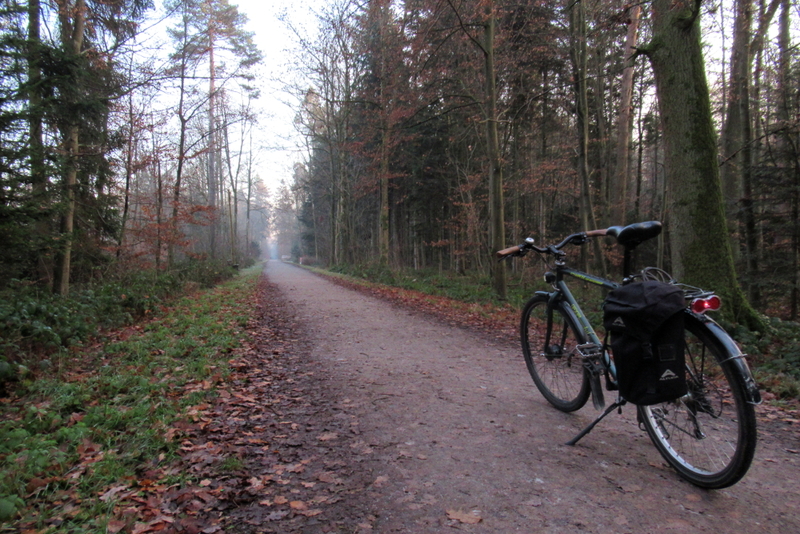 As it was about seven in the morning (and two-fleeces-and-a coat level frigid) I had the whole trail to myself…. 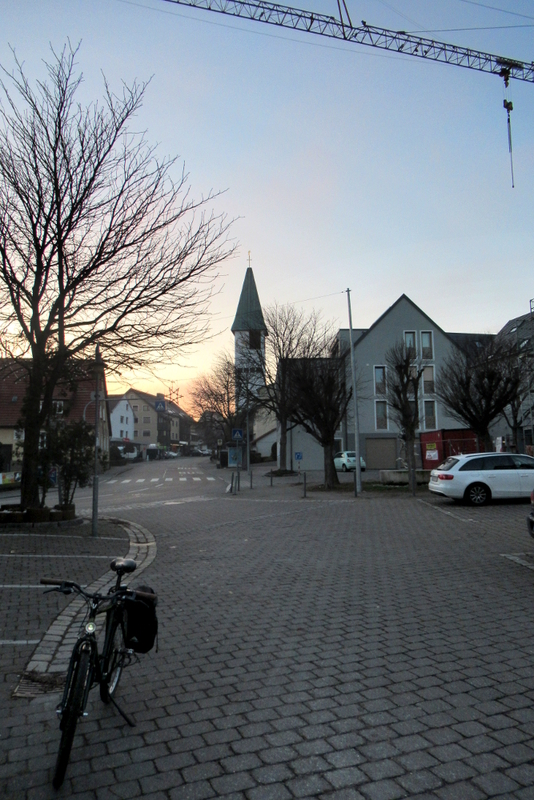 After this the trail went through a few villages: in one I was briefly startled to see a traffic jam at the bakery, before realising it was still eight in the morning. 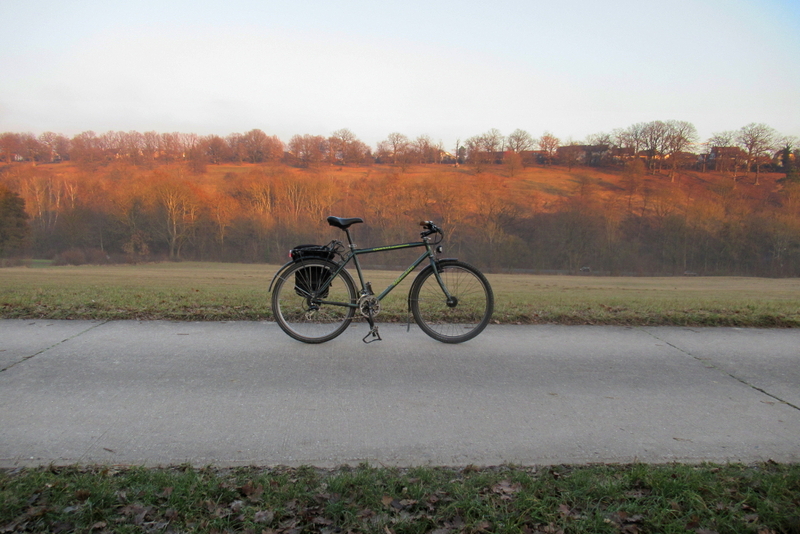 Eventually I found the pass to cross over to the Neckar Valley, and had a brief pause at the summit for celebratory supermarket brand chocolate bar and photo of distant hills. Do not adjust your set: the tower really does lean like that. Now I was on the Neckar cycleway I could concentrate on hammering out the miles plodding along at my usual pace until I reached Nürtingen. I then made extensive use of certain ancient Anglo-Saxon terms while climbing some frankly entirely unnecessary hills beyond, before dropping into another valley and through another village with a church big enough to be a cathedral, and which I’m told was once part of a Monastery. Where my family (who, bless them, are not morning people) were just starting a late Breakfast, involving those well known vital food groups, croissants and chocolate spread. We’ve been working on the most important question for the slowly developing touring bike: what colour should it be? Unusually for us, we’d decided on red when we first dreamed the project up without spending hours cogitating about it. This was fine until we actually went to get some paint and realised how many shades of red were available. We got it down to two shades, and to test it dug up my spare set of bicycle forks* to try them out. It’s going to be the darker red closest to the camera. Now there will be a race to paint the rest of the bike before one of us has another bright idea or changes our mind…. *Everyone has a spare set of bicycle forks, don’t they? Last week I needed to get a can of spray paint to make the Ugly Bike acceptable in civilised society. This would mean going to the art wholesalers, so I planned a route to follow after work. Then my colleague turned up on his carbon hardtail looking for tools to adjust something technical, so I suggested we could ride to the art shop together as he was planning to ride in that direction anyway. 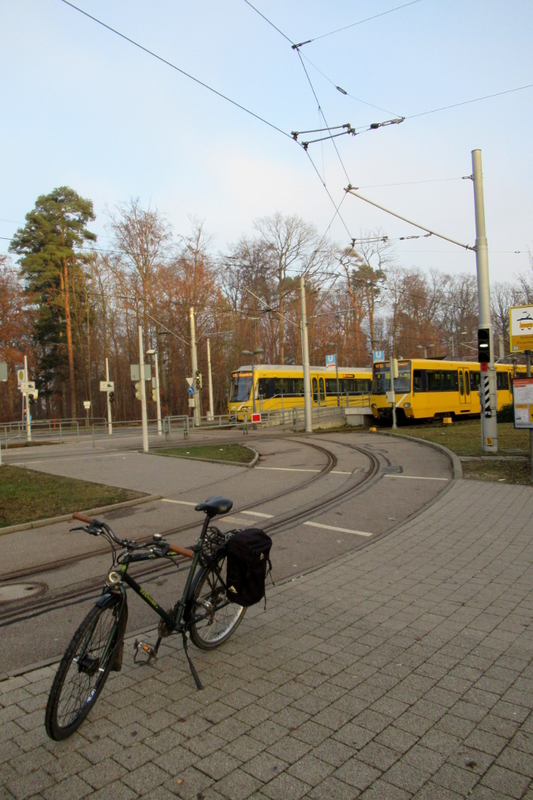 As my bike was at a tram stop at the edge of the city we agreed to meet there after work. He then cycled up the hill to the tram stop, a cool 200m climb. On 2 bar knobbly tyres. I caught the tram up the hill, and we rode through the inner suburbs which were apparently designed and built at great expense to make everyone feel grateful for living somewhere else, before reaching fields and a short climb to a thoroughly ugly but mercifully small industrial estate, then more fields to another industrial estate where the Most Dangerous Shop In the World is located. I was very disciplined and only came out with the spray can I went in for. Honest. Now rattling nicely on bumps, we went back towards Stuttgart and found the traffic free road back around the exhibition centre. The cycleway through the exhibition centre is apparently needed for more important things like parking diggers. Of course they didn’t actually tell us this in advance, just put a fence across it. Fine, we will take our bikes and lack of spending money elsewhere. We zigzagged through pretty villages and along the valley that leads to my village, then zigzagged again to avoid the Scary Hill Of Doom up and out of the valley, and rolled back down to my apartment, where my colleague filled his water bottles, and I forced him to do a test ride on the Bakfiets before letting him continue. This week was my absolutely, definitely completely final exam. I had to give a fifteen minute presentation of what I’ve been doing in the last year working in a social enterprise for people with addiction and psychological issues, and then some questions on the report I wrote. There’s a panel of four people: our tutor, the course director, another lecturer and civil servant from the state government. There are no grades: you either pass or fail. Fortunately I’d recovered from the flu and managed not to cough all over people. I’d also been reciting my presentation in every spare moment to make sure I didn’t dry up after six minutes. We all had to say our piece, and answer a couple of questions, then wait while the examiners decided if we were any good or not. Five minutes later I was asked to go back into the room, where the civil servant in the room told me I’d passed. That was it. No more exams, ever*. I’m finished. Finally. Somehow, after mostly recovering from the cold of a couple of weeks ago, I managed to get a flu/stomach virus his week, so instead of going to work tomorrow, all bright and eager, I’ll have to go back to the doctor. Knowing my local doctor he’ll probably take it as a personal affront that I am refusing to be healthy. I need to get better soon though, as I have my final presentation the week after and I don’t thing spluttering and sniffing all over the exam panel will improve my chances. Decided it was time to try going a bit further during the week so I planned a route to a bridge I’d often cross on my commute to college a few years back. There’s nothing special about the bridge itself but I wanted to use it on some longer rides and I knew the route had been blocked because there is a new rail line being built parallel to the Autobahn. As the local government is pretty pants about letting us know about cycleways being blocked I didn’t feel like getting stuck on the wrong side of it, so I took Beautiful Daughter and set off. It’s about 10k from the apartment with a couple of climbs, but I reckoned my infection was pretty much done. We dropped into the valley and took a break after about 20 minutes. Beautiful Daughter loves the loud brass bell on the Xtracycle. Unfortunately it is hard to ring while wearing mittens. With a small person on the back, I found I can’t stop quite as spontaneously as I otherwise would, which is why the next photo is just across the now reopened bridge, with Beautiful Daughter giving the apple trees critical inspection. I told her I’d be climbing the hills in the distance this year. I don’t think she was impressed. Soon after she expressed the opinion that the entertainment opportunities had been exhausted and it was time to go back. We paused on the bridge to watch the traffic and wonder why so many people needed to be somewhere else so very fast. We waved at the car drivers, but they were mostly grumpy and wouldn’t wave back. The return took longer than I expected and the asthma was awkward on occasion. I was feeling thoroughly depressed and out of shape until I looked at the ride profile and map, and realised that it was about 30 km in total, ten kilometres further than I’d though and included 200m of climbing. With the addition of a small person I decided that travelling there and back in just two and a half hours wasn’t too shabby for less than fit asthmatic. Further adventures have been planned, with and without a chatty small passenger. As expected, I’m technically ‘unfit for work’ at the moment with bronchitis and other things. From experience the symptoms improve much quicker if I move more and get outside, so I’ve been gingerly trying to ride a little over the last few days. Taking a camera seemed a good excuse to stop frequently while the coughing goes down. I also took a quick portrait of the Xtracycle, just because. It’s not looking too bad. A bit tatty after all these years, and in need of some work where things have started to go boink occasionally. Pretty much like its owner then. Past the Mystery farm, empty for at least fourteen years because to live there you have to earn money from the land. 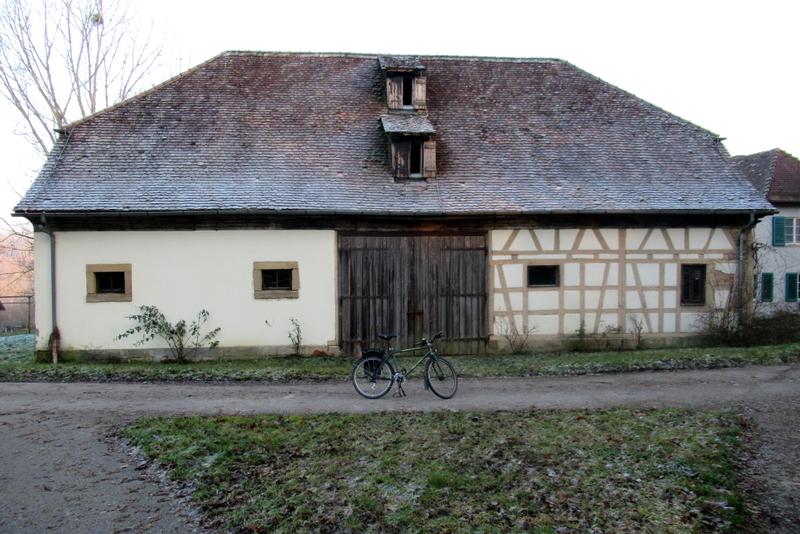 I keep wondering if the local town would be open to a ‘city farm’ type arrangement with bike cafe and theatre. Stopped again at the edge of the forest simply because I like it here. To my surprise this was nearly 10k when I checked on the map. Took me the better part of an hour though. More mildly adventurous riding to come. If I’m going to do any of these epic cycle routes I’m promising I need to get more cycling done generally, so my legs are used to the idea. With the snow holding off for now due to the magic power of snow tyres I’ve been investigating a couple of more interesting/challenging routes for the evening commute. I’d wanted to explore one of these a few days ago but I quickly realised I’d freeze Beautiful daughter, So this week I went off to find the ‘Western Route’ through the forest. I took the bike into work and rode the tram back up the hill (There’s ‘challenging’ and there’s ‘200metres in about four kilometres’) Notice commuter bike because Xtracycle is sulking with a broken gear shifter. Tram nerd information: Stuttgart’s tram system is partly dual gauge: the curved line visible is metre gauge, and the trams behind are on standard gauge track. The metre gauge system is limited to a couple of lines for preserved trams from before the gauge change. 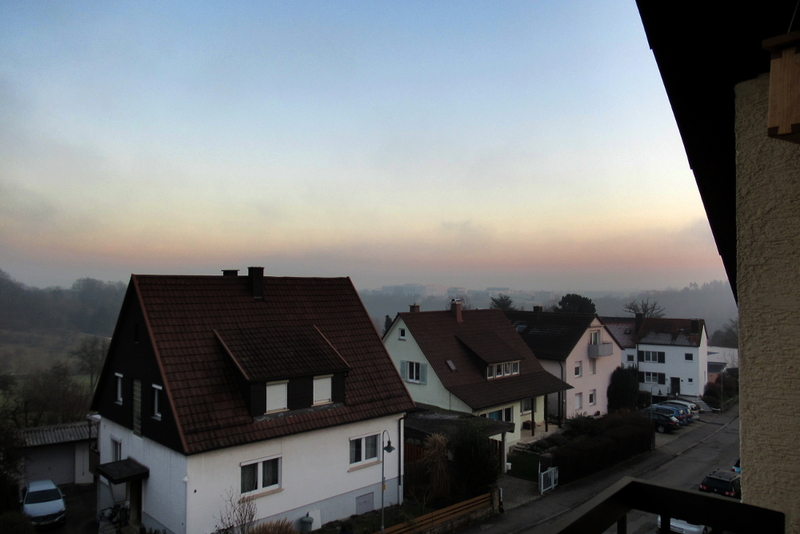 You are never more than ten minutes from dense forest in Stuttgart, even in the centre of the city. 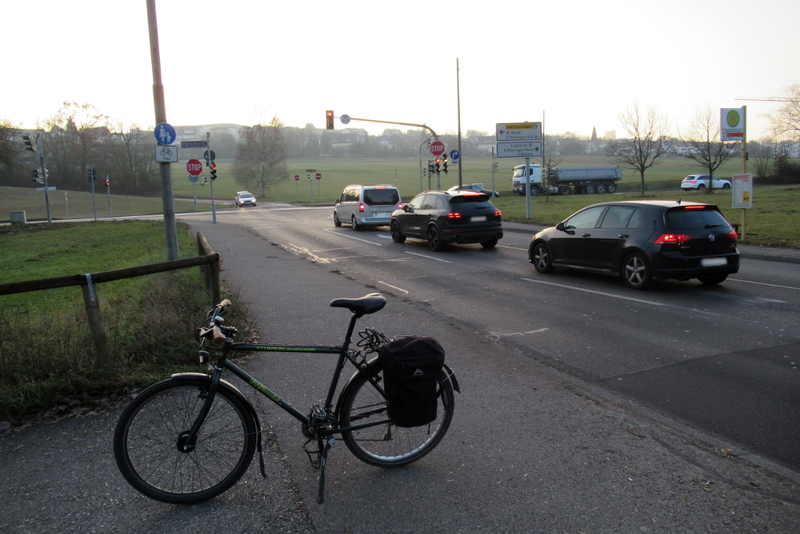 To show I don’t live entirely in a bicycle Utopia, I had to cross this junction to get to our village. Look. Cars. This trail has been badly damaged by flooding. I hope it gets resurfaced soon but knowing our local council I’m not holding my breath. In our village, and perpetual building site. I can’t remember one time in the last 15 years when there wasn’t a crane somewhere. View from balcony after getting back. Just because. A bare 7km, but now I know I can get through, I can combine it with other routes and make something more challenging. Elder Son is now a teenager, which amongst other things means that we have to arrange the bike project around his rather complex social life, but we found a couple of hours last Saturday when he was passing through so we could prep and prime the bike frame. We ordered primer, found some masking tape hidden under a sink plunger (don‘t ask me) and had been hoarding big cardboard boxes until the cellar looked like the back of a post office. In other words, for once we‘d managed to get organised and prepare in advance, so of course it rained. Thankfully I work with a local organisation and they allow us to use their facilities, including a creative workshop that has nice big windows that open. We threw everything into the Bakfiets and got thoroughly damp riding over there. Of course the rain stopped as we arrived. Then all the windows closed. It turns out the skylight closes automatically when it senses rain. Some genius connected this to the windows so now we were in a small airtight box. We decided to be optimistic: there was blue sky out there, so we would wait out the rain and incidentally attack the frame with sandpaper and get rid of anything that was less than absolutely smooth. To my rather great astonishment the sun came out half an hour later, and after repeated prodding of the switch the windows opened and Elder Son got to work.